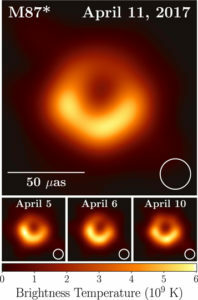 April 10, 2019, Astrophysical Journal Letters published a groundbreaking article titled “First M87 Event Horizon Telescope Results. I. The Shadow of the Supermassive Black Hole“. This article published the first ever black hole image. It was captured by the Event Horizon Telescope (EHT), a network of eight linked telescopes. When surrounded by a transparent emission region, black holes are expected to reveal a dark shadow caused by gravitational light bending and photon capture at the event horizon. To image and study this phenomenon, we have assembled the Event Horizon Telescope, a global very long baseline interferometry array observing at a wavelength of 1.3 mm. This allows us to reconstruct event-horizon-scale images of the supermassive black hole candidate in the center of the giant elliptical galaxy M87. We have resolved the central compact radio source as an asymmetric bright emission ring with a diameter of 42 ± 3 μas, which is circular and encompasses a central depression in brightness with a flux ratio gsim10:1. The emission ring is recovered using different calibration and imaging schemes, with its diameter and width remaining stable over four different observations carried out in different days. Overall, the observed image is consistent with expectations for the shadow of a Kerr black hole as predicted by general relativity. The asymmetry in brightness in the ring can be explained in terms of relativistic beaming of the emission from a plasma rotating close to the speed of light around a black hole. We compare our images to an extensive library of ray-traced general-relativistic magnetohydrodynamic simulations of black holes and derive a central mass of M = (6.5 ± 0.7) × 10^9 M_⊙. Our radio-wave observations thus provide powerful evidence for the presence of supermassive black holes in centers of galaxies and as the central engines of active galactic nuclei. They also present a new tool to explore gravity in its most extreme limit and on a mass scale that was so far not accessible. The Black Hole measures 40 billion km across which is 3 million times the size of the Earth and has been described by scientists as “a monster”. The black hole is 500 million trillion km away and was photographed by a network of eight telescopes across the world. The image shows an intensely bright “ring of fire”, as Prof Falcke describes it, surrounding a perfectly circular dark hole. The bright halo is caused by superheated gas falling into the hole. The light is brighter than all the billions of other stars in the galaxy combined – which is why it can be seen at such distance from Earth. The edge of the dark circle at the centre is the point at which the gas enters the black hole, which is an object that has such a large gravitational pull, not even light can escape. Prof Falcke had the idea for the project when he was a PhD student in 1993. At the time, no-one thought it was possible. But he was the first to realise that a certain type of radio emission would be generated close to and all around the black hole, which would be powerful enough to be detected by telescopes on Earth. He also recalled reading a scientific paper from 1973 that suggested that because of their enormous gravity, black holes appear 2.5 times larger than they actually are. 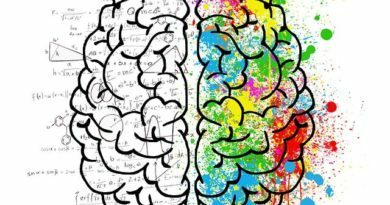 These two factors suddenly made the seemingly impossible, possible. After arguing his case for 20 years, Prof Falcke persuaded the European Research Council to fund the project. The National Science Foundation and agencies in East Asia then joined in to bankroll the project to the tune of more than £40m. 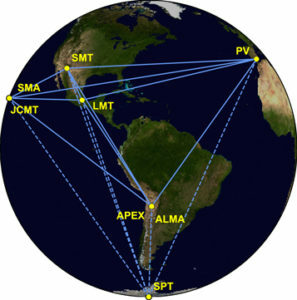 Eight stations of the EHT 2017 campaign over six geographic locations as viewed from the equatorial plane. No single telescope is powerful enough to image the black hole. So, in the biggest experiment of its kind, Prof Sheperd Doeleman of the Harvard-Smithsonian Centre for Astrophysics led a project to set up a network of eight linked telescopes. Together, they form the Event Horizon Telescope and can be thought of as a planet-sized array of dishes. Each is located high up at a variety of exotic sites, including on volcanoes in Hawaii and Mexico, mountains in Arizona and the Spanish Sierra Nevada, in the Atacama Desert of Chile, and in Antarctica. A team of 200 scientists pointed the networked telescopes towards M87 and scanned its heart over a period of 10 days. The information they gathered was too much to be sent across the internet. Instead, the data was stored on hundreds of hard drives that were flown to central processing centres in Boston, US, and Bonn, Germany, to assemble the information. Katie Bouman a PhD student at MIT developed an algorithm that pieced together the data from the EHT. Without her contribution, the project would not have been possible. Prof Doeleman described the achievement as “an extraordinary scientific feat”. “We have achieved something presumed to be impossible just a generation ago,” he said. “Breakthroughs in technology, connections between the world’s best radio observatories, and innovative algorithms all came together to open an entirely new window on black holes.” The team is also imaging the supermassive black hole at the centre of our own galaxy, the Milky Way. Odd though it may sound, that is harder than getting an image from a distant galaxy 55 million light-years away. This is because, for some unknown reason, the “ring of fire” around the black hole at the heart of the Milky Way is smaller and dimmer.